We have to say that we’re a little tired of all of our small pets – anything smaller than a cat – dying within a month of being brought home. It’s depressing and it makes us feel a little guilty for forgetting to feed them. Hexbot has come up with a robotic version of a fish that doesn’t need food, never dies, and doesn’t require you to clean out a gross, slimy tank every week. 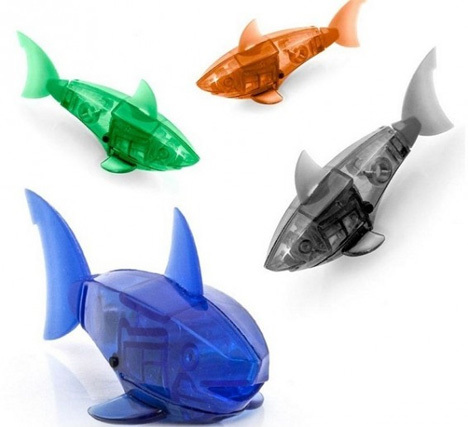 The Aquabot is a robotic fish that happily swims around its little tank, swishing its tail, diving, and swimming in different directions. The fish come in clownfish or shark varieties, and both have translucent bodies so that you can see their mechanical guts. Internal flashing LEDs make the fish a little less lifelike, but way more awesome. These fish do sleep in order to make their batteries last longer, but they wake up when you swish the water or tap a finger on their bowl. 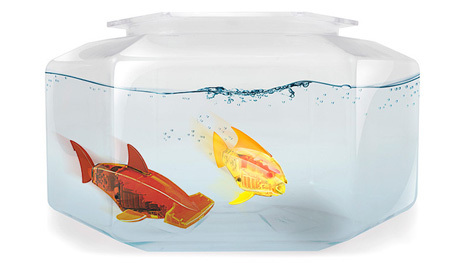 But unlike real fish, the Aquabot fish don’t expect you to feed them when you tap on their bowl. See more in Various Gizmos or under Gadgets. February, 2014.